At last week’s DNC, General Allen’s speech was met with cheers and chants while his boisterous nationalism was left unchallenged. And on Thursday night, General Allen was selling Hillary Clinton. Allen, of course, isn’t the first—and he won’t be the last—American general to enter the realm of politics. But his speech and its reception suggest that the hero worship of military figures since 9/11 has gotten, shall we say, a touch out of hand. It is long past time for a course correction. Allen not-so-humbly declared that “the free people of the world look to America as the last best hope for peace and liberty for all humankind,” and then shouted, “We are the greatest country on this planet!” While it’s clear he sought to project solicitude for “our allies” in his address, it seems not to have dawned on him that nothing alienates America’s allies (particularly in Europe) like the bombastic, self-congratulatory rhetoric he was indulging in. Allen’s nationalist remarks were greeted with loud chants of “USA! USA! 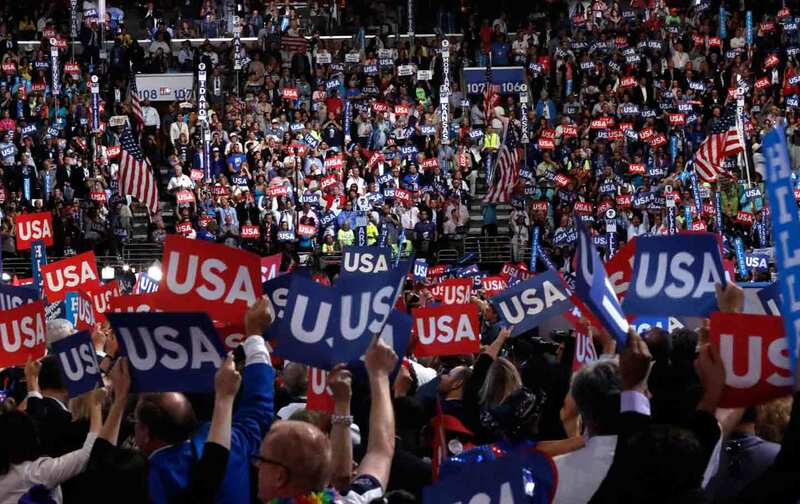 USA!” from delegates. When Allen finished, MSNBC’s Brian Williams observed that his was the kind of speech one might expect from someone who had spent 37 years in the Marines. Worryingly—but, let’s face it, unsurprisingly—instead of raising questions about Allen’s nationalist speech, his MSNBC cohosts merely emitted nervous giggles of agreement. To illustrate just how badly the Democratic Party has fallen for the charms of militarism, it might be useful to compare the boisterous nationalism of Allen to the cautious sentiments of another general turned politician. As the nation’s chief diplomat, Clinton displayed a marked preference for military rather than diplomatic solutions. And persist it does. Ironically, during her tenure as the nation’s chief diplomat, Clinton displayed a marked preference toward military rather than diplomatic solutions. She supported the “surge” in Afghanistan (2009) and the war in Libya (2011). She repeatedly attempted to sunder the “reset” policy with Russia (2009–12) and urged greater American involvement in the Syrian Civil War (2011–present). It will take citizens who understand the danger of which a former Republican president warned to hold accountable a civilian leader who has too often ceded her judgment to a political-military establishment responsible for too many of the foreign-policy blunders of the past decade.